Northland’s pole buildings are designed to meet your local codes and built with quality materials for strength and durability. The roof is engineered for the required snow load in your area and fastened every 9” at each purlin for wind strength. Our glue-laminated columns are up to 33% stronger than nail-fastened columns. Get an attractive building backed by a strong warranty and be confident that you own the best building your money can buy. Our reputation is on the line for every building we build. Northland’s sales consultants, engineering staff, and construction crews are experienced professionals dedicated to your building project. This personal commitment is what sets us apart from the competition. Northland pole buildings are virtually maintenance-free. We offer design flexibility in a variety of sizes and many color options to choose from. Call Northland for storage buildings, pole barns, garages, or any kind of steel or metal pole building. With sales offices in Wisconsin and Minnesota, our sales consultants cover the areas of Wisconsin, Minnesota, Illinois, Iowa, Upper Michigan and North & South Dakota. Check out our locations section to find a sales office near you. Throughout the Midwest, owners of Northland pole buildings have discovered that Northland pole buildings are the best value for their money. Quality materials and exceptional structural durability provide many years of maintenance-free service. Northland pole buildings are engineered so each component is a functional part of the building’s strength. That’s why we say a Northland building is… Built tough… for the Northland! 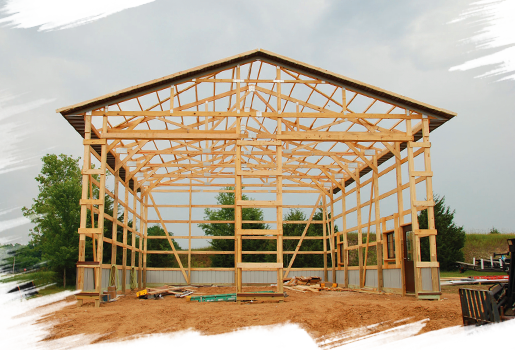 What is a post-frame building? Post-frame buildings are engineered building systems. Large solid panels come together to form your building, leading to a faster and more economical building process. Your post-frame building can also be customized to meet your unique needs and preferences. Can I customize my building? Absolutely! You can customize your building to fit your specific need and style. At Northland, you get to determine the look and feel of your building by selecting colors and adding accessories, including decorative sliding doors, dormers, and more. See what’s possible for your building with our interactive color selector. I know I want a Northland building, but I’m not sure where to start. Where can I get ideas? A great place to start for ideas is our gallery, where we have photos of real Northland projects. We always recommend saving photos of your favorite buildings in one spot, whether you pin them to your Pinterest board or save them to a folder on your device. Every building is different, but you’ll likely be surprised at how fast the process moves. Most buildings are completed in 1-2 weeks. Because we specialize in post frame buildings, you can expect a high-quality building to be constructed in no time flat. How much does a Northland building cost? Similar to construction timelines, Northland building prices vary, but we’ll discuss your budget with you and ensure we stay within that set budget throughout the entire process. Want Northland Buildings for your next project? Contact us today and start building strong for the northland.